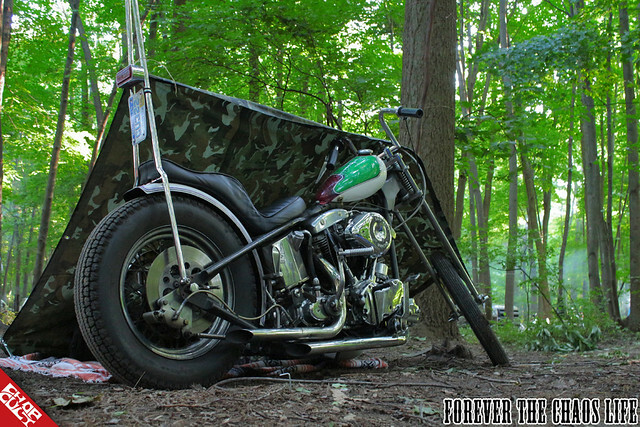 The Lowbrow Getdown isn’t the typical bike show or party. Most shows I’ve been to you walk around a parking lot, talk about bikes, drink a few beers and go home. The Getdown is something completely opposite. 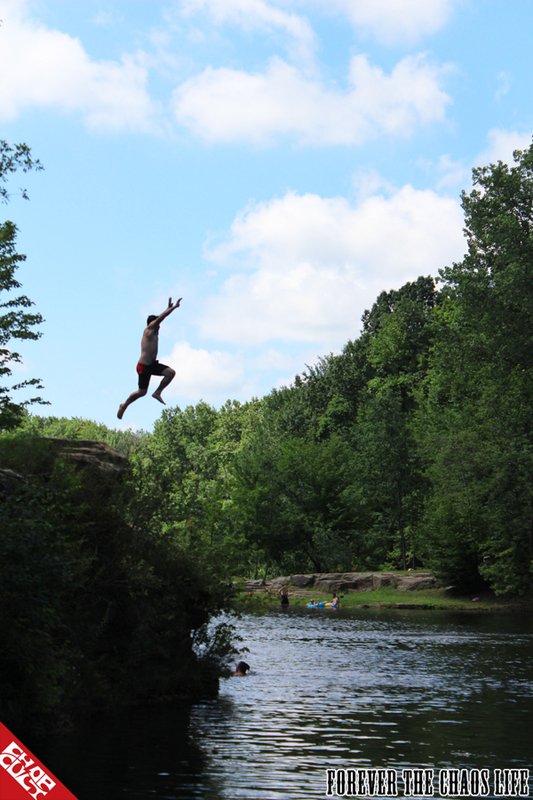 Located at Nelson Ledges Quarry Park which is a privately run campground in Garrettsville, OH about 45 minutes east of Cleveland. The park sectioned off a complete section just for the party. We rode through the woods for about 3 minutes and saw hippy van after hippy guy or gal waiving at us. Once we got to the back corner of the park, aka the “War Zone”, we didn’t just park our bikes in a row of other bikes. We literally parked anywhere we wanted to and set up tents, tarps, or hammocks. Everything was surrounded by tree coverage, it felt almost like for the entire weekend we were completely alone with the best of all friends, and allowed to do whatever we wanted. A motorcycle shanty town of rambunctious assholes that didn’t have a care in the world other than to have some fun! Some of my friends and I went a day early to get a head start on the weekend. The first night looked like this: amazing burritos cooked from scratch on an open fire by our good friend Dan Lawrence, random couches showed up by the fire, Ace of Base blasted in the woods at midnight, Pabst, rum and some random “Blue Goo” floated around with half naked dudes and gals that danced around the fire, laughter and just no fucks given. Hippies came out of the woods to see what drugs they could sell or trade for. The fine people of Canada even made it in early and joined the party. They were a bunch of really good dudes that knew how to to have a good time. Overall, Friday was a small stepping stone for Saturday. Everyone woke up around 8 am Saturday morning hung over and no regrets of what had happened the previous night. We all jumped on our bikes and rode out for some breakfast down at a local diner down the road. 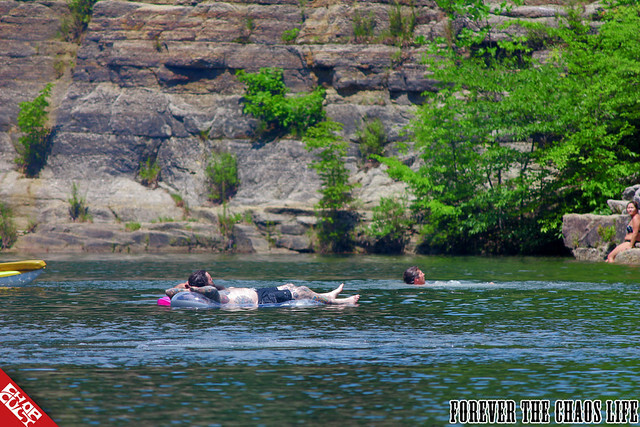 Food tends to cure most hangovers, but at the Getdown, if it didn’t - you can always go jump in the spring-fed quarry (aka lake) that’s walking distance from any campsite. 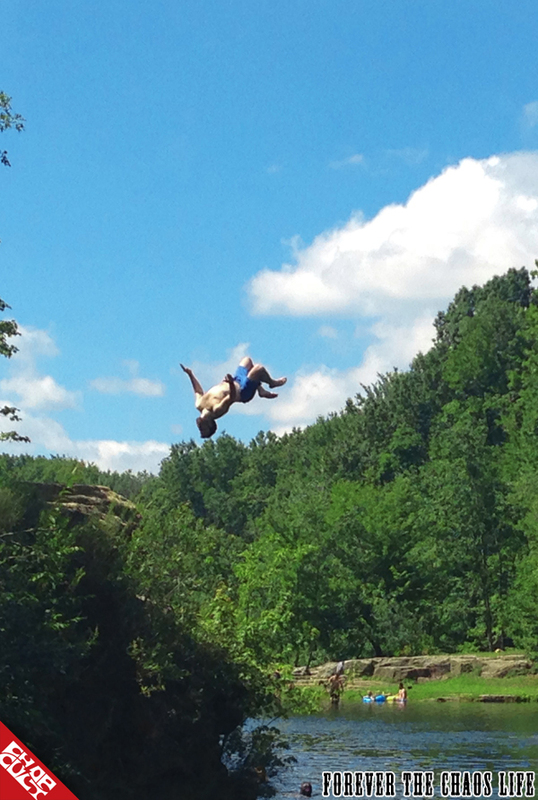 We jumped off the 15ft cliff into the water and it definitely woke us up and got us going that morning. As noon hit, bikes started filing in one after another, groups of three or more most of the time. People from all over the Midwest started to arrive. 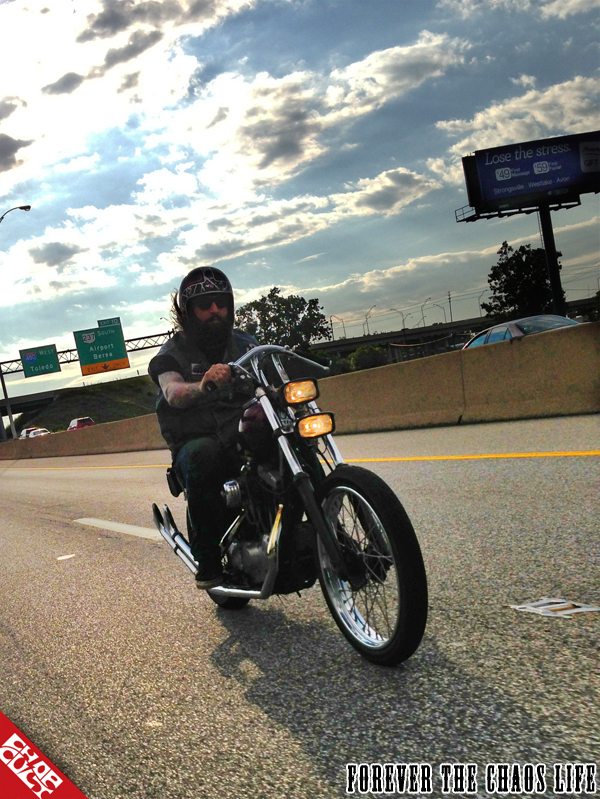 I heard one dude even rode in by himself from Chicago! The Lowbrow Customs guys rolled into the “War Zone” in style too, bringing along with them some friends, Mcgoo from Biltwell Inc. (California), Allison Funderburk (Georgia) and Jon Glover (Utah). They had brought Mcgoo to introduce Ohio the famous “Coctagon” at sundown. This was the first time I ever met Mcgoo, Allison, and Jon. All super down to earth and real people who know how to have some fun. Bands started to play around 3pm and the calm party atmosphere emerged, beers flowed, hotdogs and burgers grilled, bikes rumbled through the woods back and forward, and good music blaring. Bikes spread throughout the camp every which way you looked. 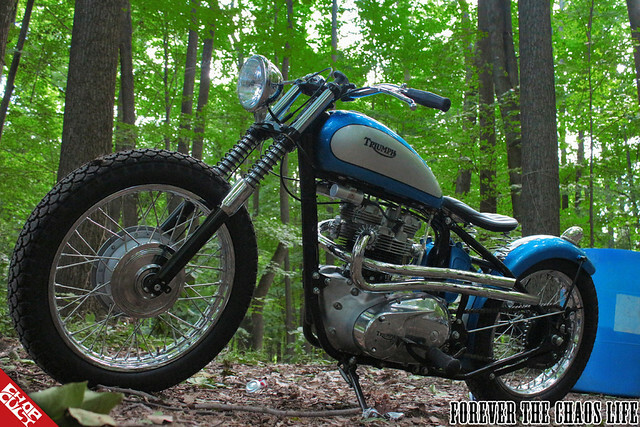 One of my favorites for sure was Todd’s new Triumph (Lowbrow Customs) just built. It was so clean and classic with just the right colors and layout of the pipes. In the end it came down to two Elyria, OH dudes, my friend Jarrett Ward and a dude know as Aggressive Brian; who I would meet later in the night. Brian's whole strategy throughout, was to just knock bats out of people's hands and it worked. He was much smaller than some of the guys in there but that didn’t matter, he won the whole thing, king of the “Coctagon”, dignity, pride, and $464 bucks! This was such a hilarious and entertaining spectacle to watch especially when Aggressive Brian puked all over the beach. Bands started up again around 9 pm and it just became a huge drunk fest, all the beer Lowbrow brought with them was gone. All the dudes were shirtless as they danced around and threw what beers they had left in the air, the girls danced in their own little sections, all while Boss Mustangs ripped some good ole rock n’roll. It was an amazing night to be alive. The couch burned up in a huge fire of glory. Slap fights ensued after the guys argued who was robbed of the “Coctagon” glory. The last of the spiked watermelons was scooped out of the coolers by hand. Good Conversations and good people throughout the night. Bear from Old Bike Barn even pulled in later with two 30 packs of Pabst strapped on his bike to save the party. Kyle Malinky and I shared a Chicken Caesar wrap by the fire that he had just found randomly wrapped up on the ground. The infamous ground sandwich was really good actually. Thanks Kyle! People were skinny dipping in the lake to clean off the beer showers they had just gotten. I think I even heard some more Ace of Base playing in the late night hours as some of the ladies were twerking. Drum circles and a couple of fights had broken out in the wee morning hours but all-in-all – what an amazing night. Every single person that showed up was genuine and true to themselves, with the same or different styles, it didn’t matter, we were all there to just have a good time. Biltwell’s slogan says it best “Ride Motorcycles and Have Fun!” I find that motorcycles bring people closer together giving everyone a common ground and friendship. I have met so many amazing people during my years of riding and it still amazes me the instant bond one can have with another person when it comes to the love of motorcycles. As long as I ride I know there will always be a party with good people where ever I go, but in Ohio, the Lowbrow Getdown is where it’s at! Last but not least, I cannot thank Lowbrow Customs, Kyle and Tyler Malinky and the rest of their guys enough for organizing one of the best parties/motorcycle shows I have ever been to. All the food, booze and entertainment they brought was just amazing and I know everyone there, including myself, are truly grateful for it. A big thank you to Mcgoo for bringing the famous “Coctagon” to Ohio for the first time, it was a riot of laughter and fun. Again - Lowbrow Customs - Thank You! 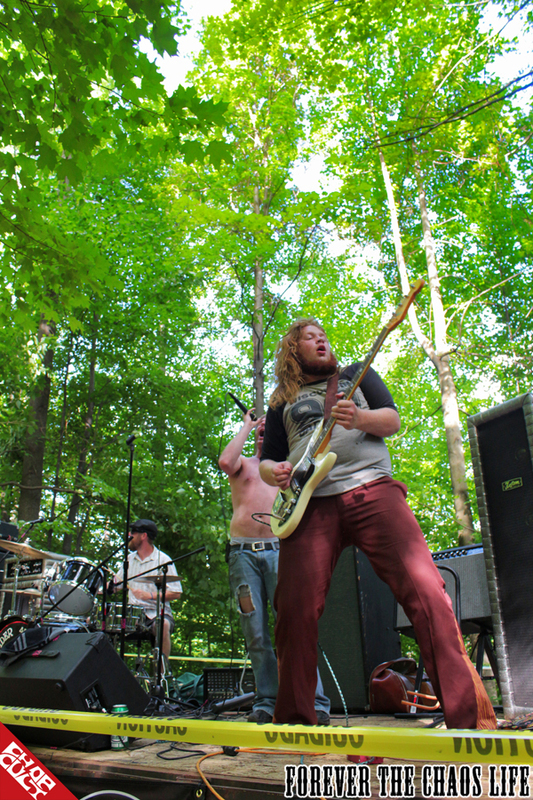 We want to thank everyone for coming, and all the bands who dragged their gear out into the woods. See you all next summer! Looks and sounds to be a good time event! Wholly crap sandwich, that looks like a damn good time. Not much better in life then rolling down the interstate and ending up in the backwoods with a bunch of freaks!!!! Great time had by all, thanks again for putting this on fellas. Great article, and as usual great photos Mikey! I was sad to have to miss the Getdown this year, but after seeing all your photos I almost felt like I was there! hay looking for info on some runs starting in april getting ready to take a long trip on my ridgid sportster looking to do around 2,000 miles and lodas of fun? oh yea have no idea where iam going or where iall end up looking for some places to stop on my way to ???????????? ?